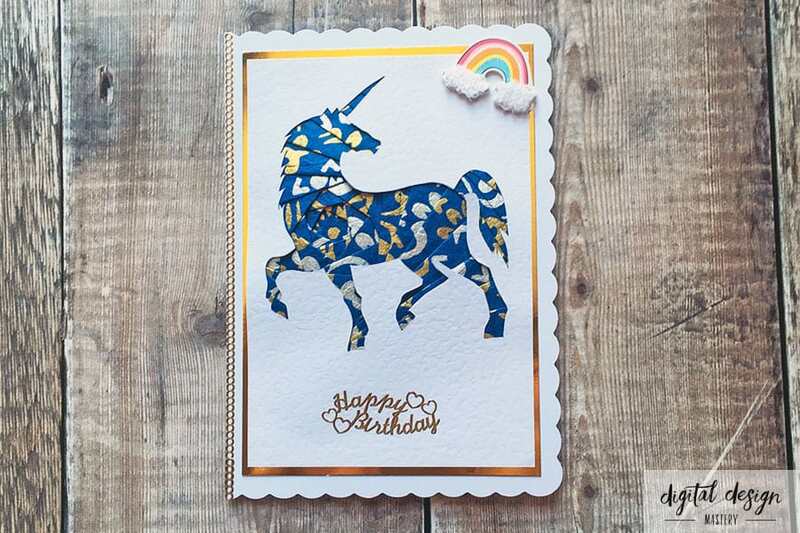 Can you believe it – it’s day 7 of unicorn week already! 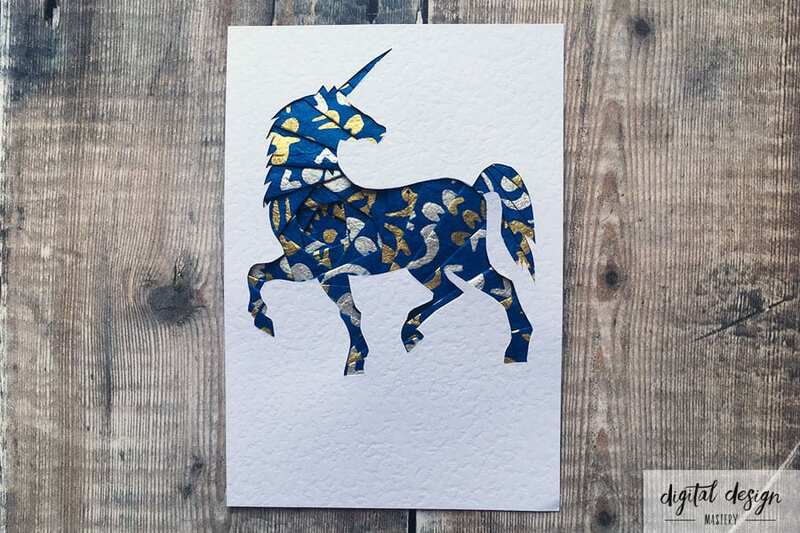 For the seventh and final craft project in this series I have created a unicorn iris folding pattern. Iris folding is my favourite card making technique because it’s relatively simple to make but creates intricate cards that look like they have taken hours! It’s also brilliant for using up scraps and offcuts of pretty craft paper and ribbon that you may otherwise have thrown away. The free iris folding pattern comes in both A5 and 5×7 inch size so you can use the one that’s most appropriate to the card size that you are planning on creating. For this tutorial I used the A5 version. 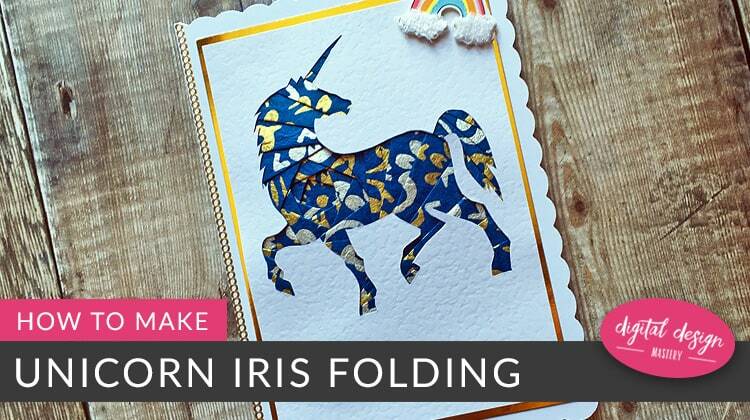 Follow the instructions below to make your unicorn iris folding pattern card. 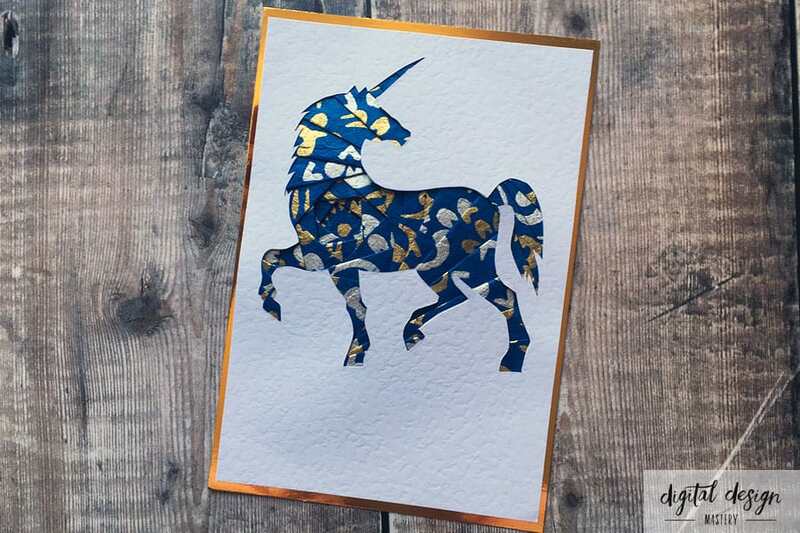 Here’s an iris folding tutorial for making your unicorn handmade card. 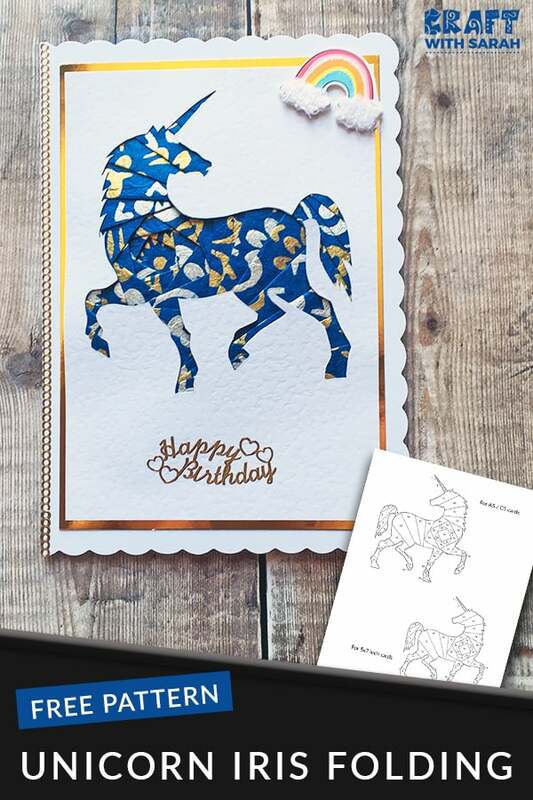 Print out the free unicorn iris folding pattern onto ordinary printer paper. 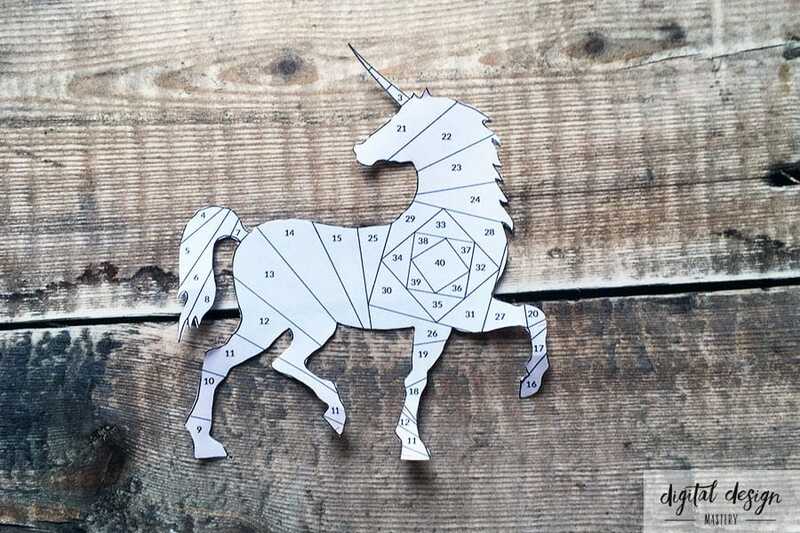 Cut out the unicorn shape. Cut a sheet of white hammered card so that it’s a couple of cm smaller on each side than your A5 card blank. 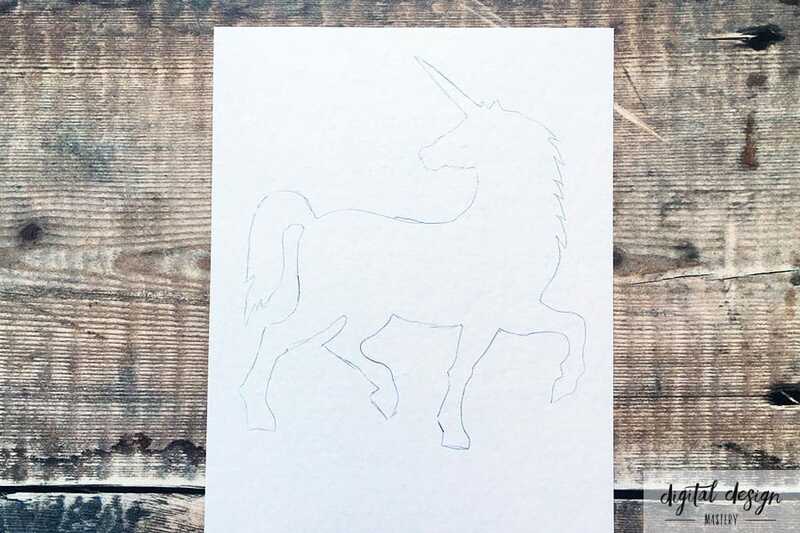 Trace around the unicorn cutout onto the BACK of the white hammered card. 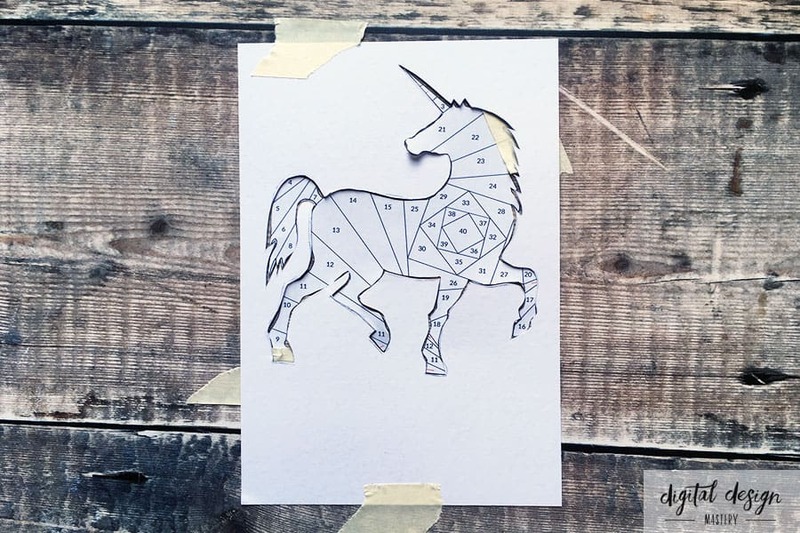 Cut out the unicorn aperture shape using a craft knife and cutting mat. The easiest way to cut out iris folding apertures is with a rotating blade craft knife. 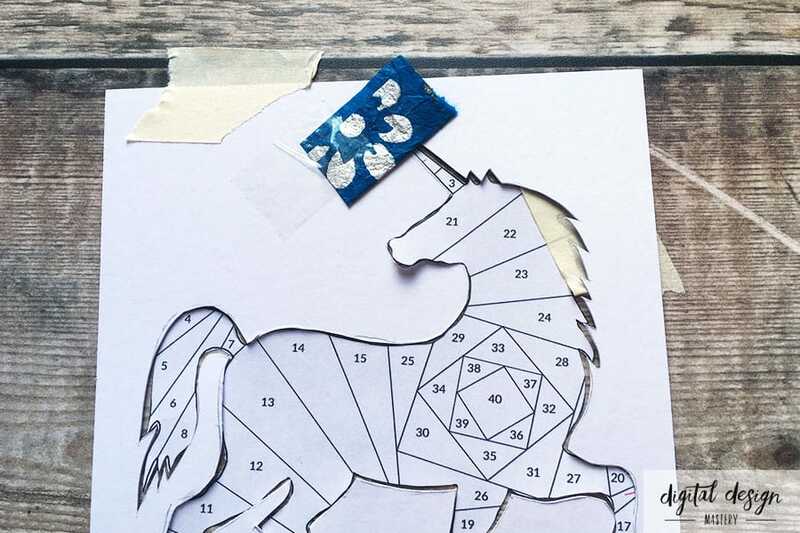 Use some masking tape to take the unicorn iris folding pattern to your desk or craft mat. This is to stop it from moving whilst you are completing the folding. Place your white hammered card on top and line up the aperture you cut with the pattern. 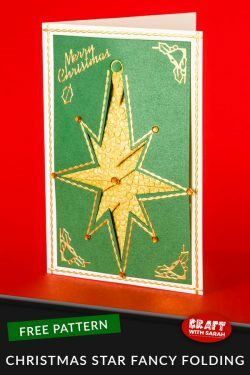 Use a bit more masking tape on the card to hold it in place. Cut strips of your coloured paper that are between 1-1.5 inches wide. Fold them in half to get a sharp crease. Cut a small piece of your paper and place the creased line along the line on the iris folding pattern marked with ‘1’. Stick the paper to the white card using sticky tape. It doesn’t matter if the strip of paper goes off the edge of the white card – we will trim it when finished. However, try not to get sticky tape over the edge of the white card as this is difficult to trim. Complete the iris folding pattern by continuing to stick strips of coloured paper along the lines on the pattern. Follow the pattern in numerical order. 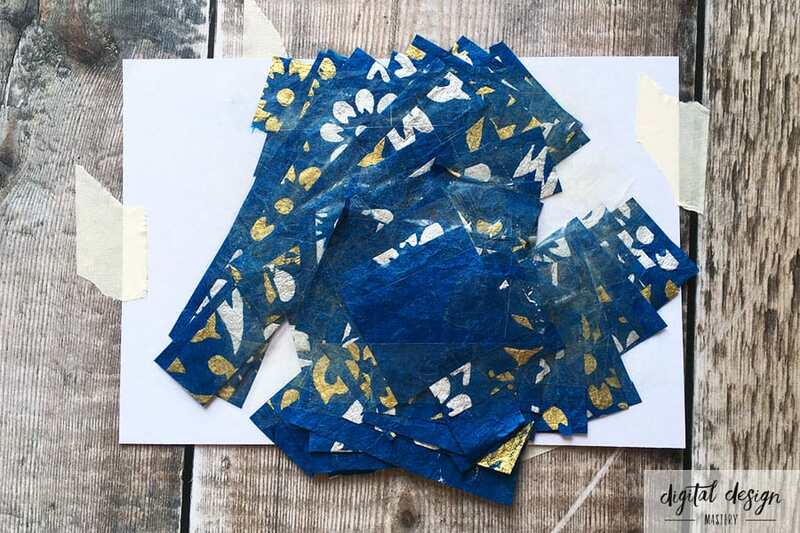 Don’t worry that it starts to look a bit of a mess as you add more paper strips! When you get to the square in the middle, stick a larger piece of your coloured paper over it to cover the gap. Top tip: Don’t get tempted and try to turn your card over before you have finished the iris folding. It’s really difficult to line it back up with the pattern again in the exact same place! 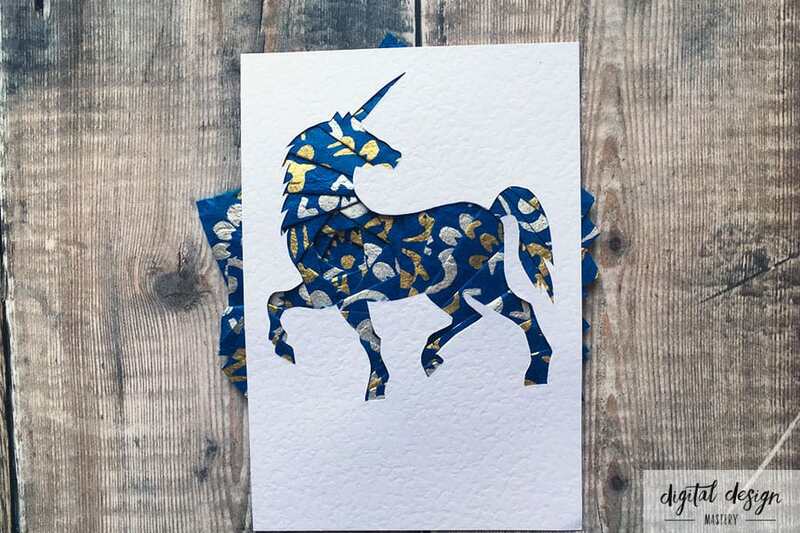 Remove the masking tape from the white card and turn it over to see your finished unicorn iris folding pattern. Use scissors to trim any paper strips that have gone outside of the white card. 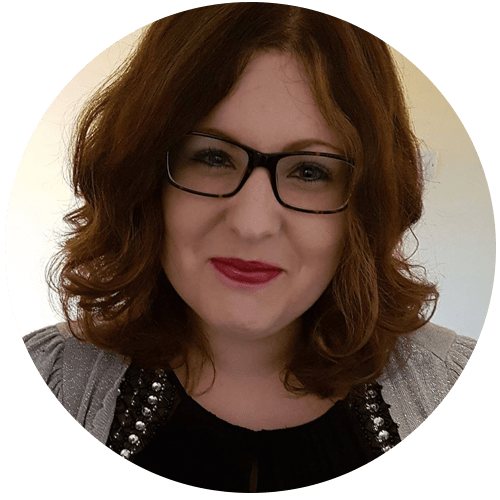 Top tip: If your iris folding topper is quite ‘bulky’ from thick paper then try flattening it between a couple of heavy books for a day or so – this works great and makes the topper look better when you add it to your card. Cut a piece of coloured card to be slightly larger than your iris folding card. I used gold mirror card for my sample card. Stick the iris folding topper to the coloured card using double-sided tape. The iris folding topper can be quite heavy depending on the paper you have used, so put tape down all four edges of the iris folding topper and a strip or two down the middle to make sure it is held firmly in place and won’t fall off! Stick your iris folding topper to the A5 scallop-edge card blank. I was very silly and stuck the iris folding topper on to the card blank a little bit wonky so I used a gold peel-off down the left side to disguise the uneven gap along the edge of the card. 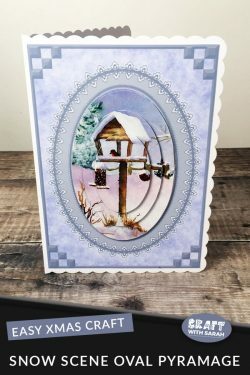 Finish off the card with a sentiment topper or peel-off stickers and any other embellishments you would like to add. 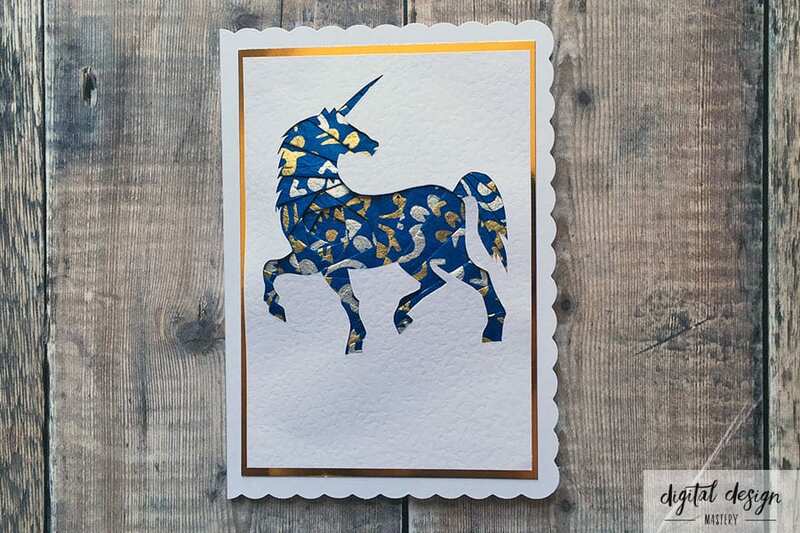 Unicorn Week is over… but you can still get the free printables! Well that’s it for unicorn week. 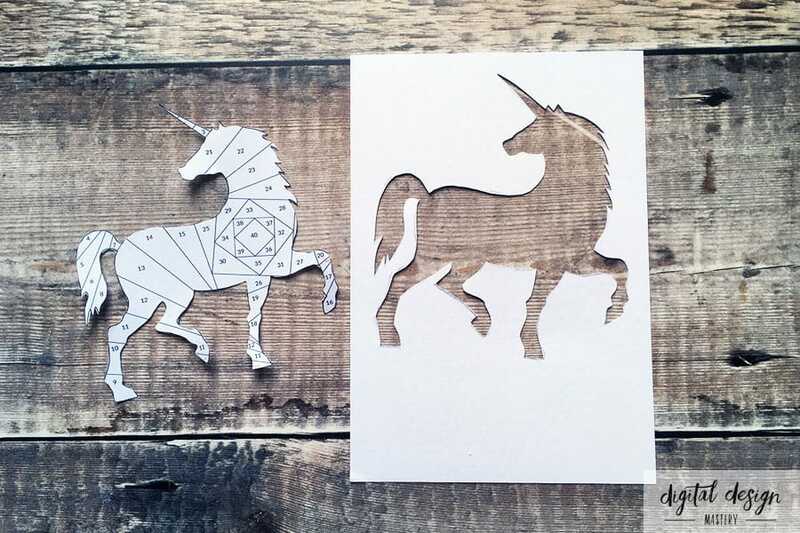 It’s been a fun week full of unicorn craft projects – I hope you enjoy making these crafts as much as I did! 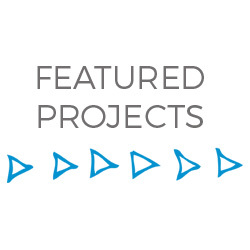 You can get all of the printables for the craft projects below in my freebie library. Please take a second to share "Unicorn Iris Folding Pattern & Tutorial" on Pinterest.